Manna for all: Who can afford to eat healthy in Israel? A basic, healthy food basket assures adequate nutrition that is essential for proper body, mind and social functioning. It is seen as a basic right in modern societies, not unlike the right to education and healthcare. In Israel, there has not yet been a meaningful attempt to define this basic healthy food basket and to examine its affordability in terms of household income, even though about 130,000 households in Israel suffer from nutritional insecurity and an even greater number suffer nutritional deficiencies. The research by Dr. Janetta Azarieva, Ben Orion, Rebecca Goldsmith, Avidor Ginsberg, Ran Milman, and Prof. Dov Chernichovsky is a first attempt to define this basket and to analyze its significance for families of varying socioeconomic statuses. A healthy food basket is divided into several food groups. The Ministry of Health has determined the basket according to the Mediterranean food pyramid as well as according to local eating patterns in Israel. This basket gives preference to natural, unprocessed foods that are organic – fruits, vegetables, whole grains, legumes, and nuts – in combination with relatively small amounts of animal-based foods: eggs, milk products, fish, chicken, and meat. The relative share of the food groups within the basket and the recommended daily serving sizes are based on the calculations of the US Department of Agriculture and the Israeli Ministry of Health definitions. There are a number of advantages to the balanced diet that the basket represents. First, it is healthy, prevents heart disease and can promote longevity. Second, it is based primarily on vegetable products and so is less harmful to the environment and to animals. Raw foods are also less expensive, in general, than processed animal-based foods products. Another advantage is that it encourages social-familial eating and home-cooked food. In order to calculate the costs of the overall basket, various product prices were examined. Since the recommended daily serving in each food group can be made up of various components – for example, the grains food group includes bread, pasta, etc. – the median-priced food item was chosen in each group. In addition, in order to lower the cost of the basket while not falling below the minimal requirement for full nutritional value, several principles were followed. Food items that were inexpensive, accessible, and that reflected the balance between nutritional value and local consumption patterns were selected. In addition, the quantity of the food item selected reflected the minimal amount necessary to attain the required nutritional value. So, for example, expensive cuts of meat were eliminated from the basket and replaced with eggs and legumes as a source of protein. After calculating the cost of a serving, this figure was multiplied by the number of servings recommended for each age group. The calculation for an adult was based on the average number of servings for men and women in the 25-50-year-old age group. For children, the calculation was based on the average number of required servings for each age group through age 18. The monthly cost of a basic healthy food basket for an average adult in 2015 totaled about NIS 844 per month, and for the average child, the cost was NIS 737. The share of animal-based protein and legumes represents about 40% of the cost of the adults’ basket; grains represent about 22% of the cost; and vegetables, fruit and milk products each account for about 11% of the total basket cost. The share of foods rich in fats represents about 4% of the cost of the basket. This distribution is similar to that of the recommended basket for children. After the calculations of the cost of the basket and its components, the study looked at its cost to households. Naturally, the cost of the basket to a household increases in relation to the number of members in the household. In addition, the average monthly expenditure necessary to purchase the basket declines as household income increases, since there is a negative correlation between household size and income level in Israel. When the population is divided into income deciles and the share of required expenditure from income is examined, there are large gaps between the two lowest and two highest income groups both in the percent of expenditure out of income as well as in the actual expenditure on food. 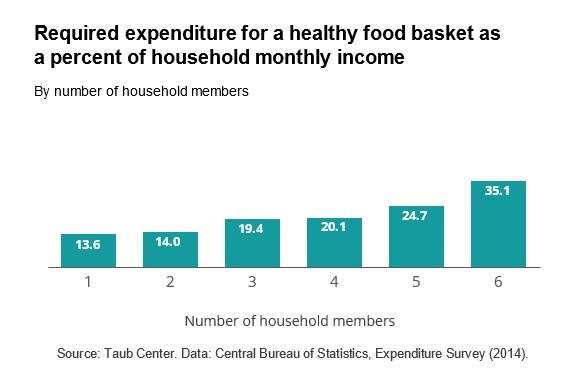 In practice, the average share of expenditure that is required to purchase a healthy food basket for a household in the two lowest income deciles is 9 times higher than in the two highest income deciles. In the highest income decile, the average expenditure required to finance a basic healthy food basket is the lowest, since the average number of household members is the lowest: 2.46. The average family in the top income quintile has to spend about 7% of their income (about NIS 2,143) to pay for a healthy food basket for all family members, while their actual expenditure is 10%. In contrast, data on the six lowest income deciles show that they actually do not have enough money to pay for a healthy food basket. In the lowest income decile, for example, the average number of household members is highest at 4.37, and thus, the monthly expenditure that is needed to buy the healthy food basket is the highest at NIS 3,450. A family in the lowest two income deciles needs to spend about 65% of its monthly disposable income (NIS 4,965) to buy a healthy food basket while in actuality, the family spends about 42% of its income on food. It is hard to know if in the four lowest deciles (and in particular, in the two lowest deciles) the lower expenditure in practice than what would be required is the result of a preference for less expensive food (and possibly, less healthy) and a different set of priorities or whether it results from financial constraints. 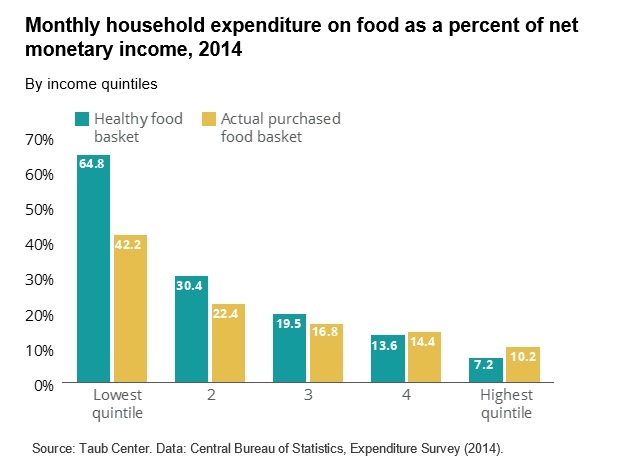 Nevertheless, it seems that relative to the higher income deciles, where the decision whether or not to purchase a healthy food basket is most likely an issue of awareness and preference, in the lowest and poorest income deciles, the purchase of a healthy basket is not a viable option in light of household income constraints and other vital household expenditures. What’s the cost of a healthy food basket?